LARKE medallist Oscar Allen says a confidence-boosting chat with WA coach Peter Sumich was a catalyst for his breakout NAB AFL Under-18s championships. Allen was this week named the best player in division one after booting 11 goals and co-captaining the Sandgropers to three wins from four games. 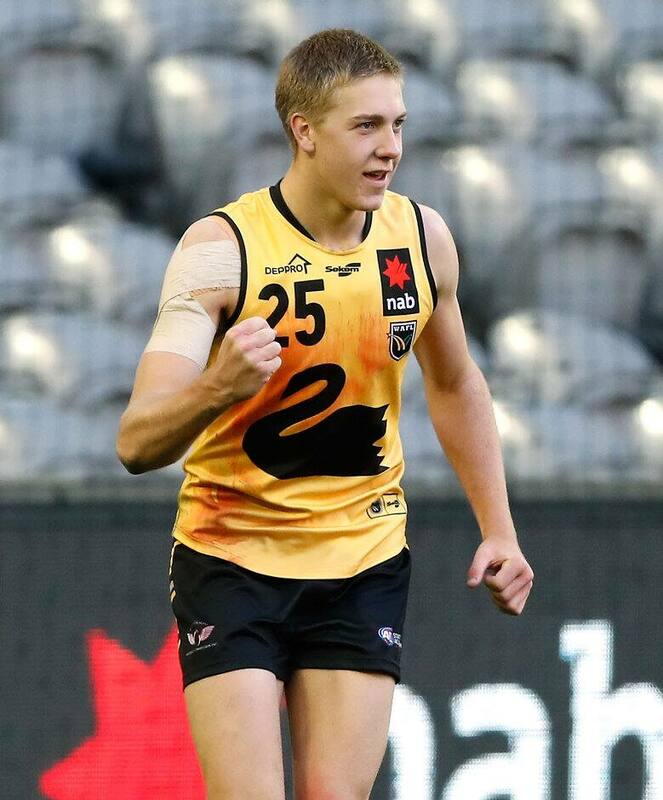 The West Perth product's superb carnival – the first time he has played state underage football – has rocketed him into top-20 draft calculations. After switching between defence and the ruck playing WAFL Colts this season, Allen was settled into attack by Sumich, who backed the athletic 192cm goalkicker to spearhead WA's forward line. "The main thing he put across to me is centre half-forward is a role where you can go three quarters and you won't even see the footy, and then in the fourth quarter you can kick four or five (goals)," Allen told AFL.com.au. "Keeping focused across the four quarters was the main thing he said – and just also a pretty good belief that I'm good enough for the position I play. "People have questions whether I'm tall enough and things like that. "But he's really put across the stance even if I might not be tall enough to play the traditional centre half-forward, in the modern era I can be a hybrid-type player. "It has given me a lot of confidence in my game." Allen averaged 15.8 disposals and 6.2 marks for WA, and has drawn comparisons to Western Bulldogs star Jake Stringer. His West Perth teammates have even started calling him by Stringer's nickname - 'The Package'. But as a wide-roaming forward, the 18-year-old models his game on St Kilda champion Nick Riewoldt and Hawthorn gun Jack Gunston. "It's a pretty hard comparison to make but (I admire) Nick Riewoldt, he's only 192 or 193cm, and he's just a workhorse," Allen said. "His aerobic ability allows him to cover the ground really well – and that's something I pride my game on is to be able to run my defenders off their legs. "Also someone like Jack Gunston. We're the same size and he's pretty good below his knees, so probably a mixture of those two." Allen was on a mission to stamp himself on the championships, and his booming kick, spring-heeled leap and strong pair of hands wouldn't have gone unnoticed by recruiters. Former West Coast great Sumich said he wasn't surprised by Allen's standout performances, which included three three-goal games, that saw him named at full-forward in the All Australian team. "The kid was outstanding with his preparation and the way he went about it in his four games and even prior to that with our scratch matches," Sumich told AFL.com.au. "I said to him 'it's a tough position (at centre-half forward) but I want you to guts it out'. "That is (getting) up and back, and every now and then you might have to stand tall, but it's a matter of workrate. "He did that and he got a result, which was really good. "I found it a bit bizarre that he wasn't named centre half-forward (in the All Australian side)." Allen, who was also a talented junior basketballer before focusing on football, grew up near the coast in Perth's northern suburbs and partly attributes his fitness to beach runs with the local surf club. He ran a 14.1 beep test at the start of this season, believes he is getting taller (he had a 10cm growth spurt as a 16-year-old) and is still exploring his football ability – with the aim of playing a senior WAFL game for West Perth later this year. Allen has also started studying business law and accounting at the University of Western Australia, and will have that to fall back on if his AFL dream doesn't work out. But becoming the first Sandgroper to win the Larke Medal since emerging West Coast star Dom Sheed in 2013 has been a massive boost to his prospects. He is now likely to be the first WA player taken at November's national draft, and is desperate to prove he can make it at the elite level. "I've been written off as someone who wasn't really well-known," Allen said. "Not being included in state squads or the (AFL Academy) it's something I am trying to prove to others that I am good enough."